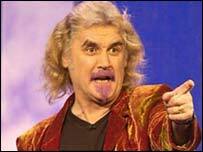 Comedian Billy Connolly has been criticised after making a joke about Iraq hostage Kenneth Bigley. He reportedly asked his audience: "Don't you just wish they would just get on with it? ", at the Hammersmith Apollo theatre in London on Monday night. The Scotsman was booed after making further comments about Mr Bigley's Thai wife, Sombat. Mr Bigley's brother, Paul, said if people wanted to pay to see such humour they could go and "queue in the rain". The comedian allegedly swore after a member of the audience stuck up for Kenneth Bigley, saying: "You're talking about a man's life Billy." Paul Bigley said of Mr Connolly: "He's a very charming chap. "I'm not commenting - he's not my type. "Each to their own - if that's what turns him on. I don't like his humour anyway." Talking about Mr Bigley's wife, Sombat, Mr Connolly said: "What is it with him and that young Asian wife?" The Muslim Council of Britain have said the comments were badly-timed. A spokesman said: "I can imagine people getting upset about that kind of humour." Mr Bigley, a 62 year-old engineer from Liverpool, was taken hostage on 16 September by the hardline Tawhid and Jihad group, along with two American colleagues who were beheaded a few days later. A spokeswoman for Billy Connolly declined to comment. Connolly: Outrageous sense of humour?